Hundreds of medical students and prospective hair transplant patients from all over India and the world witnessed Live Hair Transplant via Webinar today. 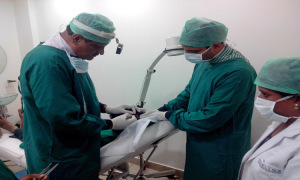 The live hair transplant was conducted at Hairline International Bangalore’s RT Nagar clinic. The surgery was performed by Senior Dermatosurgeon of Hairline International Hair & Skin Clinic, Dr. Dinesh G Gowda. This session started at 11.00 in the morning and went on till 4.30PM. The hair transplant was done with vertical harvesting technique. Vertical harvesting is the latest technique for minimizing scars during hair transplant. Commensting on the vertical harvesting technique Dr.Dinesh G Gowda, Dermatosurgeon, Hairline International hair and skin clinic says “This is a different type of hair transplant technique which is superior to the FUE technique where in there will be more quality and quantity graft with near to zero scars. In this method one can get single follicular graft and also DFU (Difolicular graft) which gives immense density and much better results than FUE (Follicular Unit Extraction). “If some one is worried about the scar in strip method they can opt for vertical harvesting. Till today globally horizontal strip method is the gold standard. This new technique of vertical strip method is in between much superior to FUE technique” adds Dr.Gowda. Speaking on the live hair transplant, Ms Bani Anand, Managing Director and Founder of Hairline International Hair and Skin Clinic said, “This event will bring out some interesting insights in the ever evolving field of hair transplant procedures. The purpose was to make it informative and educative”. Hairline has medical as well as beauty professionals for carrying out all procedures.at their six centers in Bangalore – Indiranagar, RT Nagar, Whitefield, Richmond Road, Marathhalli and Jayanagar.